The Chief of Staff provides strategic advice and support to the President and senior management team on a wide range of internal and external issues. The Chief of Staff works across all areas of the organization to ensure that York University achieves its mission, vision and priorities. The Chief of Government and Community Relations (CGCR) is responsible for providing strategic leadership to the University’s government and community relations strategies. In addition, the CGCR provides oversight and direction for the events and initiatives that are organized by the Office of the President. The Government Relations Officer will be responsible for supporting the advancement of York University’s strategic government relations strategic plan by ensuring opportunities are developed and long-term relationships are cultivated and maintained between the University and its key stakeholders which support the university’s efforts to advance our institutional strategic priorities. The Coordinator, Special Projects and Events (CSPE) is responsible for planning and executing projects and special events for the Office of the President. The Executive Assistant provides management and oversight of the President's schedule, briefing materials and correspondence. Provides efficient, professional and confidential executive-level support to the Chief of Staff (COS) and the Chief of Government and Community Relations (CGCR), as well as research support to the Communications portfolio and general operational and project-related support to the Office of the President. The Front Desk Co-ordinator is responsible for handling the queries and complaints directed to the Office of the President. He provides direct communication between the Office and the York community at all levels and constituencies. He is responsible for providing assistance to visitors, service providers, and others with business on the 10th floor of the Kaneff Tower. The Financial and Records Coordinator coordinates and processes the daily financial and administrative transactions and maintains the records management (ORMS) in the Office of the President. The Business Systems Analyst is responsible for analyzing existing and new systems recommending solutions and aligning the IT aspects of the overall business and operations with the strategic initiatives of the Office of the President, with focus on improving operations and processes involving information technology within the Office of the President. The Associate Director, Administration is responsible for the direction and oversight of the management of the administrative, financial, human resources, facilities and planning functions for the Office of the President, as well as the resource utilization and budget management throughout the Division. The Communications Assistant plays a supporting role to communications initiatives in the Office of the President. The Office Assistant provides assistance in a variety of tasks and particularly those related to preparation for meetings and special events. The Director, Communications is responsible for developing and implementing communications initiatives in support of the President's mandate. The Community and Government Relations Officer will be responsible for supporting the advancement of York University’s strategic community and government relations strategic plans by ensuring opportunities are developed and long-term relationships are cultivated and maintained between the University and its key stakeholders to support the university’s efforts to advance our institutional strategic priorities. The Government Relations Assistant plays a supporting role to the government relations initiatives in the Office of the President. The Administrative Assistant to the President is responsible for providing administrative support to the President’s portfolio under the direction of the Executive Assistant to the President. The President and Vice-Chancellor is the chief executive officer of the University. The President has ultimate responsibility for the academic work and general administration of the University, the members of faculty, officers, other employees and students, and such additional powers and duties as from time to time may be conferred upon or assigned to the President by the Board. The President is expected to bring educational leadership and a visionary approach to defining the academic and administrative focus of the University. The office works to support the President in fulfilling this mandate. The University Secretariat administers the governance of the University by supporting the Senate and Board of Governors. The Secretariat also maintains the corporate records of the University and administers the licensing of the University's names and marks. 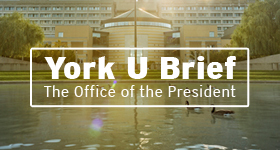 The Office of the Counsel supports York University's mission and priorities by handling all legal matters generated by the activities of the University and its faculties, schools, departments and administrative units. The Information and Privacy Office (IPO) provides public access to university records and information and protects the personal privacy of the university community in compliance with the Freedom of Information and Protection of Privacy Act (FIPPA). The Centre for Human Rights assists individuals and groups to address and resolve allegations of discrimination and harassment as defined by the Ontario Human Rights Code (Code). Our mandate covers all grounds of the Code, as well as York's human rights policies and provisions. The Centre will play a significant role in human rights education promoting a culture of equity and mutual respect. As part of its educational role, the Centre will continue to liaise with human rights groups/committees/associations both within the University and in the broader community as resources permit. The role of Communications and Public Affairs is to bring clarity to what York stands for among its many target audiences and to enhance the reputation of York by communicating York in a strategic and consistent way. The unit ensures that all communications, throughout the university, consistently meet high standards, reflect our mission and are in line with our brand strategy. Murray G. Ross was the founding president and vice-chancellor of York University and its visionary and principal architect. He also held an academic appointment as a professor of sociology. A native of Nova Scotia, he was a vice-president at the University of Toronto from 1957 until he assumed the presidency of York University in 1960. At York's inception there were a few handfuls of students, faculty and staff on a parcel of land donated by the University of Toronto (what is now Glendon College). By the end of his term in 1970 there were thousands of students, faculty and staff on York University's Glendon and Keele campuses and York was firmly established as a high quality degree-granting university. Murray Ross was an Officer of the Order of Canada. Among his publications are The New University and The Way Must Be Tried, both of which deal with York University's early history. He passed away in 2000. An economist by training, David Slater was York University's second president and vice-chancellor. A native of Manitoba, he has enjoyed a long and distinguished career as an academic, a university administrator (he also served as the Dean of Graduate Studies at Queen's University), and an economist serving as Chairman of the Economic Council of Canada, and a senior civil servant at the Department of Finance. He passed away in 2010. An economist and academic who has held senior posts in the Ontario government, Ian Macdonald served as York University’s third president & vice-chancellor from 1974 to 1984. He was a professor of economics at U of T and dean of men at University College before entering the public service in the government of Ontario as chief economist and assuming a number of ministerial positions in economics and intergovernmental affairs. Among his many honours and awards, Macdonald has received a Rhodes Scholarship, Vanier Medal for Public Service, Citation of Merit from the Court of Canadian Citizenship, Award of Merit from the Canadian Bureau for International Education, and the Governor General’s Medal. In 2005, he was honoured by the government of Ontario with the creation of the H. Ian Macdonald Visiting Economist position in the Ministry of Finance, and by York University with the George Tatham Award in recognition of a lifetime of teaching excellence. One of Canada's most distinguished legal scholars, Harry Arthurs was York University's fourth president and vice-chancellor. He joined the faculty of Osgoode Hall Law School in 1961, later became its dean and remains an important faculty member there to this day. He is a recipient of the prestigious Killam Prize for outstanding career achievements in the social sciences. He is an Officer of the Order of Canada and a Fellow of the Royal Society of Canada. A prominent historian whose groundbreaking research into women's issues has been extremely influential, Susan Mann was York University's fifth president and vice-chancellor. She came to York via the University of Ottawa, where she was the vice-rector and founder of the women's studies program. Her achievements in research and academic administration have been widely recognized and include becoming a Member of the Order of Canada and a Fellow of the Royal Society of Canada. A renowned sociologist, Lorna Marsden, PhD, was York University's sixth president and vice-chancellor. She joined York from Wilfrid Laurier University in Waterloo where she was president and vice-chancellor from 1992-1997 after serving in the Senate of Canada from 1984-1992. Among her numerous honours and awards, she was recognized in 2006 for exceptional career achievements in academia and administration with her appointment to the Order of Canada. Mamdouh Shoukri was appointed the seventh President and Vice-Chancellor of York University in 2007. 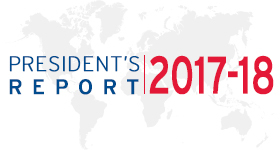 He completed his decade-long tenure as President on June 30, 2017. Following seven years of conducting and leading research in the power industry, he began his career in academia at McMaster University, serving in a number of leadership roles there including Dean of the Faculty of Engineering and Vice-President Research & International Affairs. A champion of innovation, he has guided York’s transformation into a comprehensive and research-intensive university, and overseen the advancement of York’s internationalization and social innovation agendas as well as plans for future growth in York Region. He was named a Member of the Order of Canada and the Order of Ontario in 2013, and is a recipient of honorary degrees from McMaster University and Amity University. A Fellow of the Canadian Academy of Engineering and the Canadian Society for Mechanical Engineering, his scholarly interests are in thermo-fluid science, and he is the author or co-author of more than 120 papers that have appeared in refereed journals and symposia.